So I have the entire month of April off to celebrate Thai New Year. 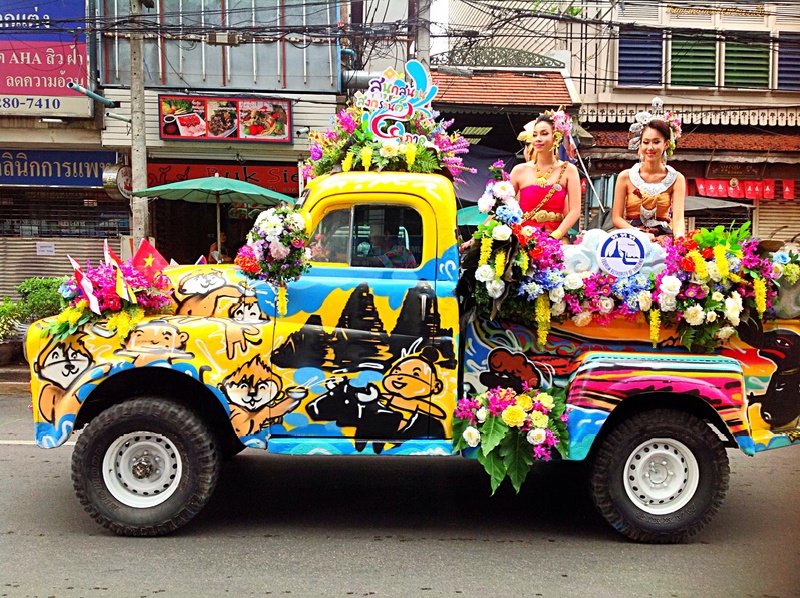 We asked the locals in Phuket what we farangs should do with ourselves during the festivities and the unanimous vote was for Kohsan Road in Bangkok. 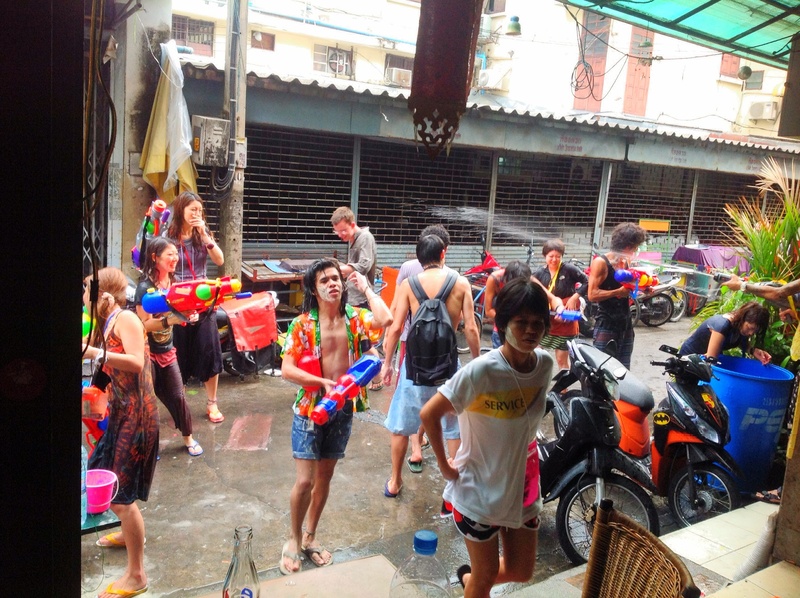 We’ve made our way here and tonight will launch a 6 day city wide water gun fight to ring in the new year. 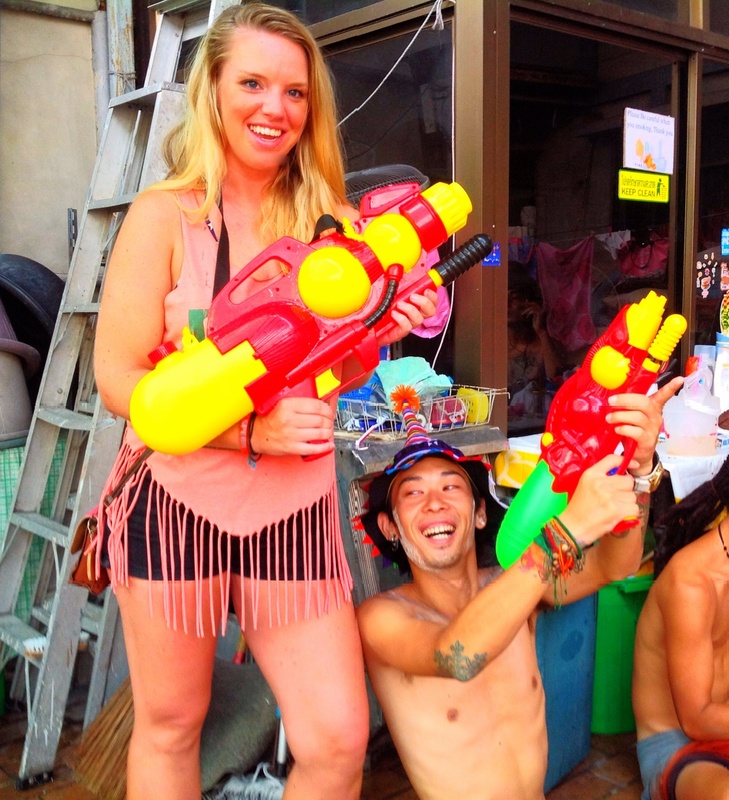 If you want the who what when where why history google it yourself because all I needed to here was six day party and water fight….sold. 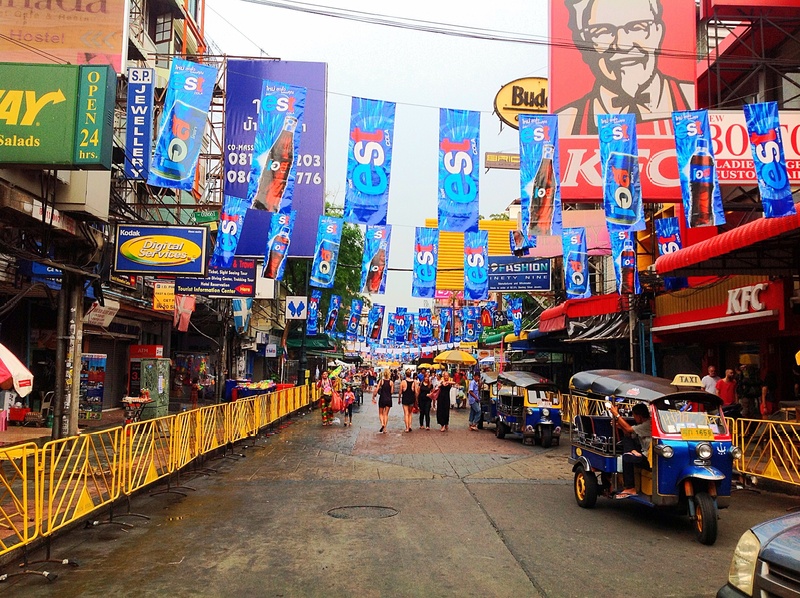 Kate and Erica walking down Kohsan Road…..where the magic happens. In the preliminary set up for this water fight I’m seeing some definite groups and alliances forming and it’s time to pick a side. Its a big commitment, kind of like the first day of school….who are you going to sit with at lunch? Everyone knows you can’t just go hopping tables in the lunch room without creating a societal uproar. That’s how this water fight is going to go, I can already tell. I’ve gotta choose my friends and enemies wisely cause I’m stuck with them for the next six days. The Locals – Pro: They have access to free water supply and hiding places. Con: They are a tough nut to crack. Definitely the popular table. The Children – Pro: You can use them as a shield and people will hesitate for a second before they launch an attack on you. Con: Kids have no loyalty, they’ll turn on you in a second. Kids are the mean girls. The Farangs – Pro: We share the same aggressive war strategies. Con: I can actually understand what they are saying and they are really annoying to listen to. Farangs are the jocks for sure…but not talented ones….I’m talkin like someone who did one year of JV wrestling but still wears his letterman jacket religiously. The Korean Hippies – Pro: Strength in numbers, there are a ton of them. Con: They are naturally un-athletic and take frequent smoke breaks. Hippies are…yeah still the hippie table except now their tattoos are real and they can actually grow facial hair (well, some of them). 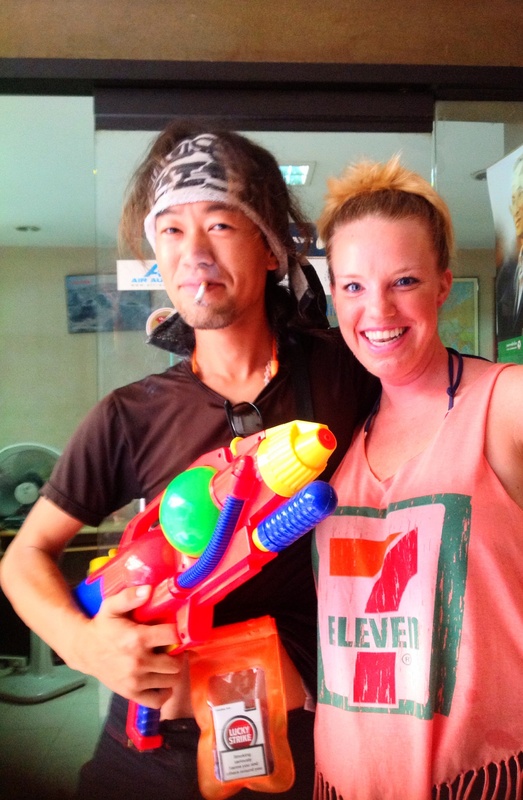 Korean Hippies vs. Locals outside our hostel…..it’s goin down. Me and one of the hippies. Aim for their cigarettes and you’ll make some enemies real quick. I don’t know what side I’ll end up on in all of this, but I’m goin out guns a blazin in my ‘Merica bikini. Happy New Year Thailand, it’s playground rules from here on out! Ohhhhh man. This is gonna get nasty. I see the Korean Hippie has a waterproof bag for his cigarettes. Now that’s serious. Do the Koreans have anything to say about North Korea and Crazy Kim’s missile threats? So……this is awkward, they are Japanese. I thought I was getting better at telling my Asians apart! You do have Scandanavian blood in your dna but I’d take Russian and run with it.